After much consideration and a few years of experience, I’ve chosen option #5 from this post exploring ways to integrate Classical Conversations history sentence memorization and The Story of the World. This means that we study world history chronologically by reading all four volumes of The Story of the World over a period of three years, roughly corresponding to the CC history sentences memory work in Foundations and more closely corresponding to the themed writing in Essentials. The beauty of this schedule is that my kids will go through world history twice during 1st – 6th grades (once as a light introduction with some picture books and a second time as an in-depth study with integrated writing) before beginning the Challenge program in 7th grade. CC Foundations cycle 1 history sentences cover a broad range of civilizations and geographical regions from ancient to modern, only roughly chronologically due to the various lengths of time each civilization was flourishing (and a few of the sentences really jump around on the timeline because they are grouped by geographical region rather than chronologically). We’ll be focusing on the ancient civilizations for our in-depth studies, but we’ll be placing each one of the history sentences along with the facts from the history timeline (which students memorize in full from ancients to modern every year) in our new timeline book. I am tutoring an Essentials class this year, and both Luke and Leif will be joining me. So we will using the Ancient History-Based Writing Lessons from IEW and writing papers using literature selections from and non-fiction sources about Sumer, Egypt, Israel, Babylon, Greece, and Rome. 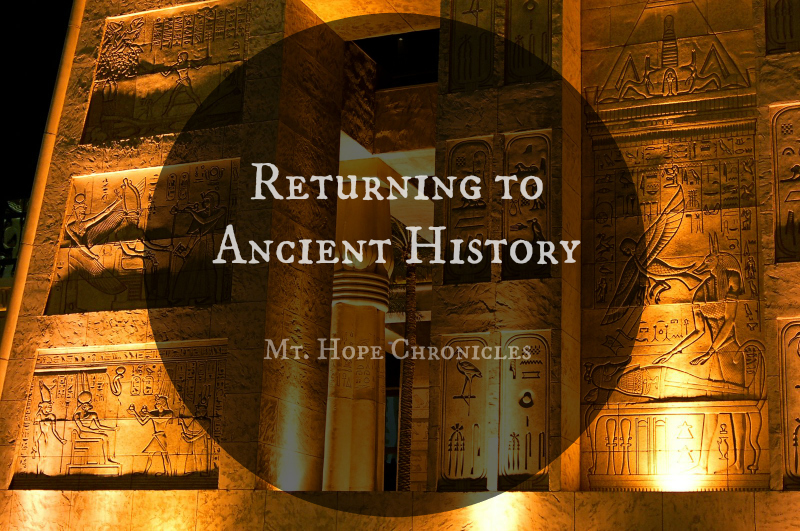 Our last time through the Ancients, I posted an extensive list of literature selections, so I’ll focus on mostly non-fiction books and resources for Ancient history and geography in this post. I’ll share our resources for cycle 1 math, science, Latin, English grammar, and fine arts in an upcoming post. If you wish to read Our Big-Picture Educational Scope and Sequence Integrated with Classical Conversations, check out this link. It covers our progression in all subjects from Pre-K through 6th grade. Honestly, our children are so blessed to have so many excellent books and resources available to them in this day and age. This list could have been much longer, and I know there are many other beautiful, informative, fascinating, or hilarious books out there that we don’t have (yet, ha!)! This is a wide range of books from simple picture books to longer chapter books. Some are serious. Some are meant to be funny and entertaining. I prefer a wide variety! Chester Crab Comix: Greeks, Romans, Countrymen! Thank you, Heidi! This is very helpful! I enjoy reading your blog! Your post a while back about the 5 options for incorporating CC & SOTW was an answered prayer! Do you plan to pretty much stick to SOTW Vol 1 for Cycle 1, then Vol 2-3 for Cycle 2 and Vol 4 for Cycle 3? Amanda~ Ideally, I'd like to do vol. 1 during cycle 1 and then continue during CC break times (particularly spring time) so that they are more evenly spread out over the 3 years. This past "tour" I did vol 2 in cycle 2 and then volumes 3 and 4 in cycle 3. Thank you Heidi, your 'lists' are exceptional! Will be looking back for some of these resources. I can't tell you how grateful I am for your booklists as inspiration, especially in this season with baby just around the corner. I am feeling rather intimidated at the prospect of schooling three this year, with a newborn and preschooler in tow and am so thankful for this jumping off point for our history reading this cycle. Also love that I can trust that your recommendations are quality books and resources. Thank you so much!